I have been able to eyeball things, so they are approximate. I would like to come up with an equation to get an exact number for either dimension A or B. I came up with an angle for A of approx 44.7 deg where all the teeth mesh. 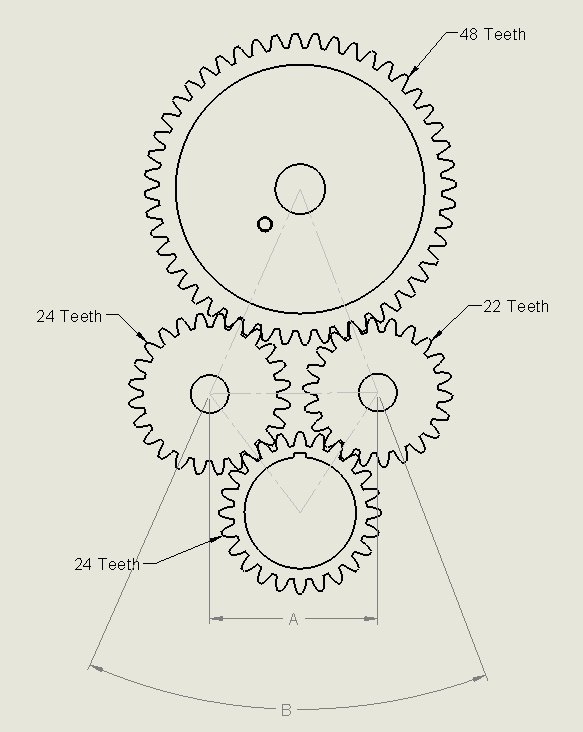 Basically what I ended up doing is all the angles are multiples of the tooth angle for each gear. Next I took a line at the tangent points of each gear perpendicular to a connecting line between each angle. See the blue lines in the above picture. 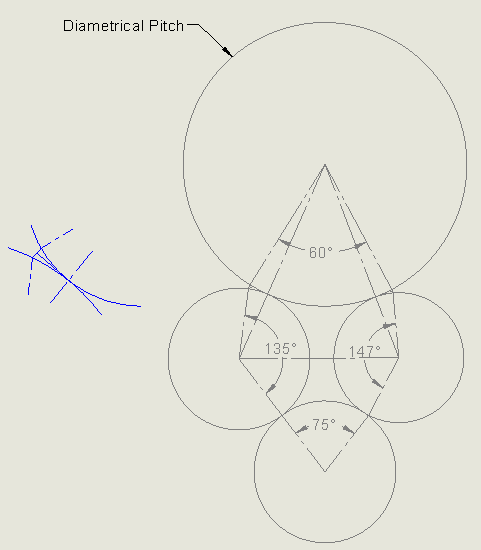 In this problem the tooth angle can not be used to calculate the spacing directly because of the gear mesh as seen on the bottom of the 22 tooth gear as seen in the top picture. The meshing actually takes place off of the tooth angle. You can solve this by modeling the gears as abutting circles with their cicumferences proportional to the number of teeth. It will be easier to then work with the radii instead of circumferences directly, but the rest is just basic geometry. You will have to decide one more constraint than pictured. There are several ways to express this degree of freedom, but one is how far apart the two middle gears are. Or, you could specify how far apart the top and bottom gears are. Thanks for contributing an answer to Engineering Stack Exchange! Not the answer you're looking for? Browse other questions tagged mechanical-engineering gears or ask your own question. Reverse-engineering spur gears - do I have enough data to make a gear that will mesh correctly? What is the deflection of planet-ring Gear Mesh along the pressure line and the position of the Plant gear? What is the tolerance on gear pitch?